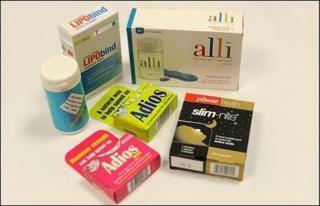 There are hundreds of weight-loss aids now available on the UK High Street, but can they really help you lose weight? A review of slimming aids, on behalf of the BBC, has concluded there is little or no published medical evidence to support weight-loss claims associated with four of the five products investigated. The products, considered a cross section of the market, included Adios, Biosynergy Hoodia Gordonii, LIPObind, Slim Nite and Alli. "There is good evidence for the efficacy of Orlistat (Alli) in weight reduction but it should not be used as the sole element of weight management," says Dr Colin Cable of the Royal Pharmaceutical Society of Great Britain, who reviewed the products. Alli is only available to people with a body mass index of 28 or higher. "For the four others investigated, there are no published randomised clinical trials to support their efficacy in weight loss," Dr Cable added. NHS dietician Ruth Kander, who also reviewed the products, said: "People want a quick fix in their life, they want to lose weight really quickly, and they don't want to give up their favourite foods, they don't want to work hard at what they're eating. "But that's not real life and that's not what clinical practice is about. And some of these products haven't got the research which is needed to see that they're effective." Adios is a herbal medicine containing fucus (seaweed) as well as the herbs boldo and dandelion root. Adios Max is also based on fucus extract but is of "maximum strength for slimming". Claim: "Can help you to lose weight by speeding up your body's metabolic rate." Verdict: "Fucus has been used in herbal products that are claimed to have anti-obesity properties. There is a lack of clinical research assessing the effects of fucus and rigorous randomised controlled trials are required. Herbal diuretics including boldo and dandelion root are claimed to cause weight loss due to reduction in fluid load but there is no published evidence to support this." Manufacturer responds: "The absence of [published clinical data] does not mean there is no evidence to support their effectiveness. On the contrary, in the special case of those herbal products, such as Adios, that are formally licensed as medicines, reassurance on their effectiveness is supported by very many years of marketing experience, to the point where the medicines regulatory authorities are satisfied as to their effectiveness." Alli is the over-the-counter version of the prescription drug, Orlistat. It works by preventing the absorption of fats from the human diet, thereby reducing calorific intake. It should only be sold to adults with a Body Mass Index of 28 or more and should be used in conjunction with a reduced calorie, lower-fat diet. In May, the US Food and Drug Administration said Orlistat (both Alli and the prescription medicine Xenical) would now carry additional safety information after reports of liver-associated side effects, although an investigation established no "cause and effect" relationship. Claim: "Alli is clinically proven to help you lose more weight than dieting alone." Verdict: "There are several systematic reviews demonstrating the efficacy of Orlistat in producing modest weight loss in overweight and obese patients. Orlistat is a licensed medicinal product whose quality, safety and efficacy will have been assessed as part of the licensing process." Manufacturer responds: "Alli is the first and only non-prescription weight-loss aid/medicine to be licensed for use throughout Europe." Biosynerygy Hoodia Gordonii is a traditional herbal medicine. It has long been known by the indigenous populations of Southern Africa, who used the plant to suppress appetite when making long hunting trips in the Kalahari Desert. Claim: "Clinical trials of Hoodia have shown that calorific intake can reduce by up to 1000k/cals per day." Verdict: "No clinical studies in weight reduction in humans were found. One company (Phytopharm) has patented P57, claimed to be the active ingredient of Hoodia. The company claims to have carried out double blind clinical studies that demonstrate that P57 creates a sensation of feeling full thus reducing calorific intake in overweight subjects." LIPObind is categorised as a "certified medical device" as its effects inside our body are deemed mechanical rather than physiological. Its active ingredient, Litramine, is derived from dried cactus. Claim: "A clinically proven fat binder that contains Litramine, a patented fibre complex, which readily binds with fat from food to become a large fat-fibre complex, that is too large to be absorbed in the small intestine. It is then naturally passed out with no harmful side effects." Verdict: "The official Litramine website presents data from four studies to support its fat-binding properties and one for its weight-loss claims. There is no indication on the website to where data relating to the clinical study on weight loss can be found. Searches of databases found no published clinical studies to support the weight-loss action of Litramine in humans." Manufacturer responds: "LIPObind is made from dried cactus extract, which in clinical trials that include a double blind and placebo-controlled study, has been shown to remove up to 27.4% of undigested fats from a standard meal." Slim Nite is a food supplement containing three amino acids: L-ornithine, L-arginine and L-carnitine. The labelling says three capsules should be taken every evening before going to sleep and stresses that food supplements should not be used as a substitute for a varied diet. Claim: "Research suggests that carnitine is a normal constituent of the body where it plays a vital role in converting stored body fat into energy." Verdict: "Three studies investigating the effects in humans of L-carnitine were found. Two of the studies found that the amino acid did not promote weight loss. The third was not able to show the specific effect of L-carnitine in weight reduction." Manufacturer responds: "Power Health inherited the Slim Nite product when we acquired a company called Reevecrest Healthcare in 1987. We knew that the ingredients were safe, that it had been formulated by Dr Caroline Shreeve (a medical doctor with years of experience and an author of books on dieting) and that customers had reported success with the product ... We don't make any strong product claims for Slim Nite."